Hi Bloggers, have you ever thought about having a blogger desktop editor or any blogger desktop applications by which you can write and save posts offline?. what an amazing and time saving idea hmm?. Writer is already packed with useful features, but if you like to tinker, there are all sorts of plug-ins you can add to help you do even more—like insert your stuff from Facebook, Flickr, or other websites. With Writer, you can preview everything you’re adding to your blog, to see how the fonts, spacing, colors, and images will look, before you publish. Supports: Windows Live, Wordpress, Blogger, LiveJournal, TypePad, SharePoint, Community Server, and many more. 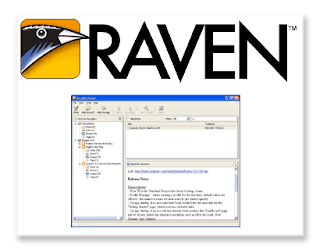 Zoundry Raven™ is our most advanced WYSIWYG full featured editor that makes posting to your blog easier and faster. It's as easy to use as a word processor, plus we include simple tools to add links, tags, photos, music and video files, and more. 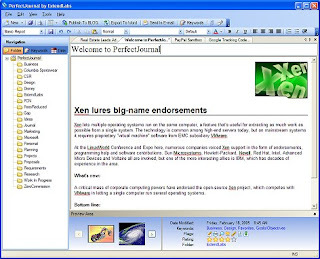 Blogjet is the most advanced Windows blog editor and manager. Get convenience and speed of a native application, and the ability to write posts offline using Blog jet. 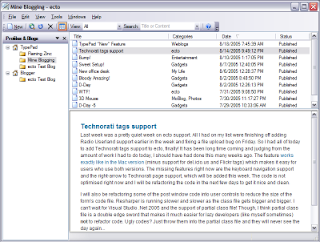 This popular Windows blog client can used for almost all blogging platforms. 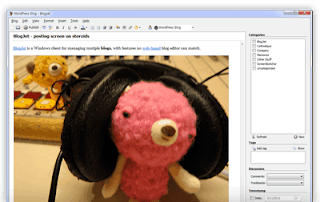 A beautifully designed WSIWYG editor lets you create your blog posts with ease with no HTML knowledge required. You can add image, videos, tags and smileys and multiple attachments. Supports: WordPress, TypePad, Movable Type, Blogger, MSN Live Spaces, Blogware, BlogHarbor, Squarespace, Drupal, Community Server, etc. 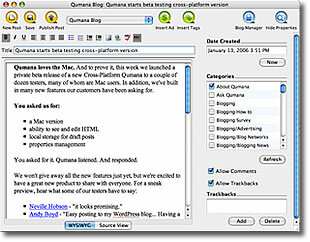 ecto is a feature-rich desktop blogging client for MacOSX and Windows, supporting a wide range of weblog systems. With ecto you can write and manage entries for your weblog(s). The advantage over using your weblog's control panel is that you can compose entries offline and use the extra features ecto offers, such as spellcheck, creating links, attachments, and much more. ecto is designed to make blogging much more easier and yet give the users as much power as possible to manage their weblogs. Supports: Blogger, Blojsom, Drupal, MovableType, Nucleus, TypePad, WordPress, and more. Perfect Journal is the FrontPage/Dreamweaver of the Blogging. Create your journal entry in PerfectJournal and publish it directly to Blogger.com. No more worrying whether your blogging site might go down or out of business with your content. Create, write, rewrite offline and publish online, Integrate your blog thoughts with all your other content and search it quickly. Currently supports publishing directly to Blogger.com only. RocketPost is smart blog software for power bloggers. 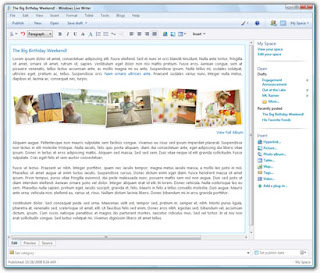 It has one of the easisiest WYSIWYG editor, full local editing and full blog import. And it works just like email, so you already know how to use it. Speed up your blogging with one-click Technorati, Flickr and Del.icio.us tags, built-in photo editing, instant photo albums, automatic linking to related posts, quote tracking, quick linking, drop caps, pull quotes and a running word count. Its fully multithreaded design lets you edit multiple posts and publish to multiple blogs at the same time, so it never slows you down. You don't need to know a thing about HTML code to make perfect posts. Write your posts at your own pace without having to be online. you can Publish your post, then repost it instantly to another blog. No more messing with different blog accounts or hosting services. 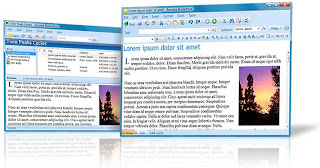 The w.bloggar is an application that acts as an interface between the user and one or more blog(s); in other words, it is a Post and Template editor, with several features and resources that the browser based blog editors do not offer. Another great advantage of w.bloggar is that it is compatible with most of the weblog systems available, allowing an advanced user to have only one interface to several accounts hosted on several different sites, using different publishing systems. Supports: Blogger, Wordpress, MSN Spaces, TypePad, BigBlogTool, Blogalia, TheBlog, Blog-City, EraBlog.NET, Upsaid, UBlog, SquareSpace, BlogWare, DearDiary.Net. Get free information related to "9 Blogger Desktop Editor & Applications - Write and Save Posts Offline".